is part non linear stream of consciousness, part time capsule of sorts. Ground Shots is meant to be a recollection of and reflection on moments, reactions and engagements with place and the land. sometimes it includes prints. sometimes it includes plant lists. sometimes it includes drawings or scraps of little things from distinct places. it might be cut and paste, or letterpress, or some other form of printmaking. it might be hand bound or not, it might be a guide to doing different kinds of things with the land. it could sometimes be an object, or come with an object that is an extension of the ideas held within. or point to an object. occasionally it might pair with a potion that can be used inside the body, or on the skin, made from the land. it is not just an herbal zine, that gives instructions on how to make medicines, or ID plants, or get to know a landscape. but it may or may not include these things sometimes. it is a more often a collection of feelings and movements coming into being indirectly. It says things sideways. It processes the land and the world and the movement of ideas mostly from the perspective of a person from the deep south, finding their body on distant lands and in distant cultures. It started while on Signal Fire's Wide Open Studios Summer Immersion traversing on foot the Wallowas in Oregon and Bitterroots in Montana and Idaho studying the complex dynamics of being on stolen native land. It began as I started drawing the ground during my wilderness solo, as a meditative practice aimed at staying present. Then, I realized that lots of things I do are shots of the ground. They are attempts at processing the world using art and alchemy. 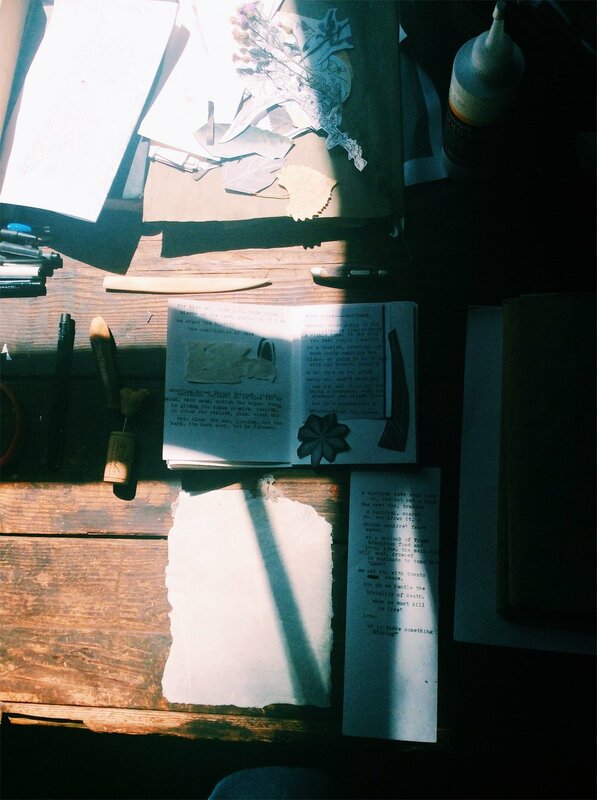 It became a zine after the trip was over and I hunkered down alone in a cabin up above the Colombia River in Oregon for a month. The first one, deemed '1/2' was cut and paste style, copied and printed at a local UPS store. Ground Shots '1/2' "Working in Resins"
Read the blog post on the birth of Ground Shots Here.